Welcome to Deal & Deliver Teleseries! This call will assist you to gain clarity when making any kind of deal with someone -- in regards to your job, your business, your relationships, family, friends, etc. What if this call could change everything with how you function in business and in your life? This call is originally from the Conversations In Consciousness Teleseries with Gary Douglas. Note: Please be sure to log in to your Access account before making this purchase. 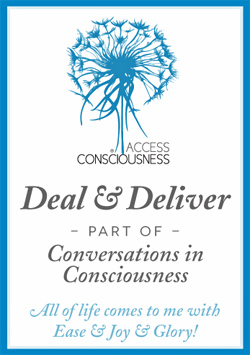 What is Deal & Deliver Teleseries? Deal and deliver is the primary way in which you can handle your life, your business and everything that has to happen in life. Pragmatic, practical and straightforward, this call gives you the kinds of questions you should be asking and the information you need to create what you would like in life. Getting clear on what you and each person is going to deliver makes sure: (1) the deals you make will work for you, (2) you find out quickly when the other person is not the right person or (3) you learn that they can only do so much for you. So you’ve got to be willing for what you desire to be delivered, or not delivered. And that’s the thing about recognizing what the deal is. What is the deal? What will this person deliver? What can they deliver? is the question. Will they, and can they, deliver what I’m asking for? If you don’t function from the question – will this person deliver, then what you are always assuming is, it will work out because you’ve decided you want it to, which is the fantasy that you will always get what you want if you say it right, do it right, or confront the person right. What if having this information will give you the clarity you require to know what the deal is, and what the deal is not?